I would like to say I am very satisfied, especially how each paragraph was so detailed and analytic. Thanks for the draft.Thank you. Literature maps are a way to graphically show different relationships between literature and are useful in identifying areas where literature on the same topic agree and disagree. When many different pieces of literature are involved it is especially useful and makes visualizing relationships and connections easier. Literature maps are also versatile and can be adapted so that they may also be used to analyze individual literary works such as novels. The principles involved are still the same as when performing a literature review of many works. You can find our literature map example above. The lit map is still used to show relationships and connections between ideas. Whether it is being used to analyze a novel or as a way to help organize a literature review, literature mapping can be modified to focus on only one concept or to take in the work as a whole. Expand your literature map – Supporting ideas, in turn, may spawn further secondary supporting ideas. Your main idea has several supporting ideas. The supporting ideas, in turn, have other ideas that support them. For example, the main idea, A is true because of supporting idea B and B is true because of its supporting idea C so that including C strengthens the position taken on A. These secondary supporting ideas can then be linked with branches to the original supporting ideas and keywords added to those branches. Expand and make connections until there are sufficient supporting points or there are no further relevant connections. Add keywords – Keywords can now be added to the connecting branches that provide an explanation of the relationship between the main idea and each supporting idea linked to it. Basically, this explanation is how the supporting idea backs up the main idea. This visual representation can help you to see similarities between supporting ideas you not have noticed before. Write down concepts that support your position – With a thesis statement, you have adopted a stance. The concepts or points you write down now are the reasons why you have adopted this position. They should be connected to the main topic by branches that connect supporting ideas to the main idea. Identify a question or theme – In a literature review this may be your thesis statement or it may be a theme you want to address in a novel. The theme/question identified is your main idea and should be fairly broad so that you don’t limit the number of relationships that you are able to make as you develop your map. The main idea should be written down. Try various groupings – After initially identifying different relationships, try grouping supporting ideas based on how they are related to determine the best way to present your position. If you need a professional literature review, don’t hesitate to come to us, we offer a wide range of services, including academic paper, lit map and book literature review writing services. Our business is designed to provide our clients with a go-to place if ever they need someone to work their magic on their literature review paper. Once you send your order to us, we will make sure that you will get the best results especially since you will be paired with a writer who knows your course. Professional writers and editors: Each member of our team is post-graduate holder from various industries or fields. Research from scratch: We don’t use any paper mills, but we research and write from scratch to ensure the originality of the paper. Access to different online libraries: Our team has an access to a wide range of education and organization libraries, guaranteeing a complete research for you. Free proofreading: Our services offer free proofreading service that comes with every order, ensuring that your paper is flawless and free from grammar, spelling and punctuation errors. Free annotated bibliography: When you order from us, we can provide you with a free bib that goes with your order. 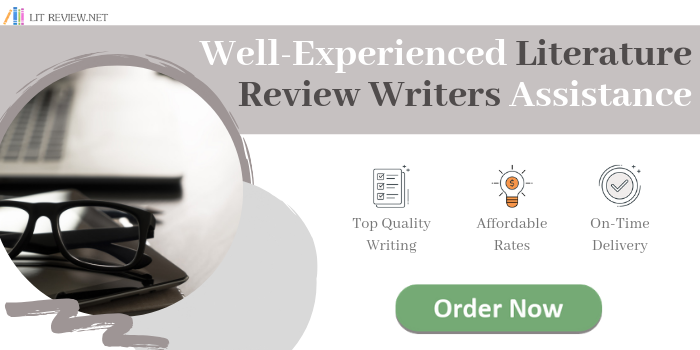 Full suite of literature reviews: We offer all types of lit review services, including MLA lit reviews, APA lit reviews, and dissertation lit reviews and thesis paper lit reviews. Contact us for any help on these literature reviews. In-depth analysis of literature: Our team is well versed in conducting all types of literature reviews. We have combined years of experience in performing these types of tasks and completing any type of research papers. Free plagiarism report: We use only the most robust plagiarism checkers to ensure the originality of your paper. Don’t hesitate to call us and ask help to make your literature maps today!